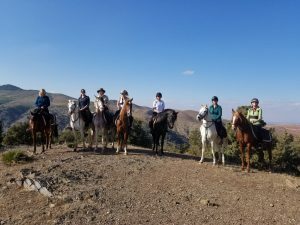 Centre Based riding holidays are spent in one location, riding out in different directions each day and returning to the same accommodation each night. This type of holiday is a great choice for someone who is concerned about their riding fitness or would prefer fewer hours riding. Another advantage of being centre based is that you can choose not to ride every day, so you can take a break to relax or explore the local area. This makes it ideal for non riders too. 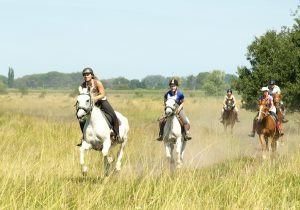 They can participate in more aspects of the holiday as often there are often more activities on offer than just riding. Hours in the saddle vary and often you can often book more riding on site. An excellent horse riding holiday discovering the diversity on offer in Israel. This trip includes riding both in the Negev desert in the south and around the Sea of Galilee in the north as well as a visit to the Old City of Jerusalem which is host to some of the most important historical and spiritual sites in the world. Riding is usually fast-past but can be adapted to accommodate other levels of riders. Accommodation is in comfortable cabins on the farms. 2019: Available all year on request excluding July and August. Riding Ability Required: Intermediate onwards. Riders must be confident at all paces in open spaces and fit enough to maintain long periods of trot and canter. Transfer: 2019: From Tel Aviv 500 ILS or Ovda airport 350 ILS per vehicle (1-4 pax) each way. Car hire is an alternative option. Guest house trail from Maremma to ride with the Butteri doing traditional cattle work. Comfortable accommodation, fantastic horses ridden in Western tack and exceptional food and wine await you. Situated in a peaceful, picturesque valley in the heart of Chianti and within easy reach of Florence, this holiday combines riding through classical Tuscan countryside with empathetic instruction and offers riding for all levels of rider from beginner onwards at their own level. Accommodation is in an 18th century country villa featuring terra-cotta floors, wooden beamed roofs and arched ceilings and a swimming pool with glorious panoramic view over the Tuscan hills. Transfer: 2019: from €80 each way per car. See itinerary for more details. Small family based hotel with many non riding activities at your doorstep. Offers lessons, based stays, star rides and 2 trails, all returning to same accommodation each night. 2019 Discovery week/Star rides: Saturdays from 12 Apr to 31 Oct (High Season: 3 to 23 Aug. Mid Season: 20 to 26 Apr, 25 May to 2 Aug and 24 Aug to 6 Sept. Low Season: 12 to 19 Apr, 27 April to 24 May and 7 Sept to 31 Oct). 2019 Trail to the Sea: 28 Sept; 12 Oct.
2019 Maremma Trail: 4, 11, 18 May; 14, 21 Sept.
Meeting point: Follonica train station. Please see below for more information. Transfer: 2019: €30 per person each way from Follonica train station 8am-6pm, an easy 1 hour train ride from Pisa Airport. Supplement of 40 % for night transfers (7 pm to 8 am). It is also possible to fly to Rome and get a train to Follonica (approx. 3 hrs). Great riding for all abilities and lots for non-riders at this enchanting 17th century castle; immerse yourself in the peaceful Italian countryside and stay in the carefully restored farmhouse. There are lessons available as well as riding with an onsite spa for relaxing treatments to help you recover. 2019: from 1 March to 6 November. Week-long programmes start on Saturdays, weekend programmes start on Thursdays, mid-week programmes start on Sundays (High Season 18 Jun to 16 Sept). This can be flexible - please ask your travel advisor. Trip Length: From 3 nights/3 days riding to 7 nights/6 days riding. Please see sample itineraries for more information. Approximate riding time per day: From 2-6 hours depending on the itinerary chosen. Riding Ability Required: From beginner onwards, depending on the itinerary. Intermediate onwards for full day and Medieval Castles Ride. Transfer: 2019: Return car transfer per car from €40pp payable onsite. See Itinerary for more detail. A special Show Jumping tuition and trail riding combination at an excellent riding centre in Umbria with lessons by a trained FISE instructor teaching show jumping and dressage. 2019: 23 Mar; 20 Apr; 4, 11 May; 15 Jun; 13*, 20* Jul; 3*, 24* Aug; 7, 28 Sept; 19 Oct (* denotes high season). Other dates on request for groups of 2 or more. Transfer: 2019: included from Spoleto train station. This is an easy 2 hour train trip from Rome. Transfer time from Spoleto is approximately 15 minutes. A residential week combining scenic riding with the discovery of an area surprisingly rich in nature, history, culture and culinary wealth. All year round Saturday to Saturday. Welcoming riding centre specialising in western riding and trekking including courses and instruction in Tuscany, Italy. 2019 Taste of Trekking: 30 Mar; 20 Apr; 15 Jun; 3* Aug; 10* Aug; 21 Sept.
2019 Western Perfection Course: 6 Apr; 13 Apr; 8 Jun; 13 Jun; 3* Aug; 17* Aug; 28 Sept.
2019 Etruscan Mini-Trail: 6 Apr; 13 Apr; 11 May; 1 Jun; 22 Jun; 29 Jun; 31 Aug; 5 Oct. Riding Ability Required: From novice onwards. Transfer: 2019: From Rome Ciampino/Rome Fiumicino airports €250 return (approx. 2.5 hours) or Chiusi-Chianciano Terme railway station €35 (approx. 1 hour) at set times on Saturdays. Other times on request (extra charge). Toscana Cucina is a full service ride with the perfect combination of excellent riding, cooking, wine tasting and sightseeing to destinations of cultural and historical interest. 2019: 3, 24 Mar; 14 Apr; 19 May; 2, 30 Jun; 12 Aug; 15 Sept; 13 Oct; 10 Nov. Arranged on request from Rome (€420), Bologna (€350) or Pisa (€300) airport, or Sienna outside of set time (€100). Price is for 8-seater mini-bus and driver. Please note a charge of €30/h applies if the minibus has to wait at the airport for delayed flights. Payable on site. 3 free lessons to all 2019 Umbrian Adventure holidays booked by June 30. Set in unspoilt countryside, surrounded by woodland, overlooking mountains and valleys on all sides. This ride caters for everyone from beginners to experienced riders with its based stay and trail itineraries. The summer itinerary involves an optional night camping by Roman Ruins and this riding centre will also give you the opportunity to experience a magical night ride lit by the full moon and fireflies. The Wine Trail: 18 May (4 or 7 nights). The Macerino Trail: 21 September (4 or 7 nights). The Monteleone Trail: 29 Jun (5 or 7 nights). Dates on request for groups of 2 or more for Umbrian Adventure and 4 or more for the Summer Adventure and the trails. The Macerino Trail: 8 days/7 nights/6 days riding or 5 days/4 nights/3 days riding. The Monteleone Trail: 8 days/7 nights/6 days riding or 5 days/4 nights/3 days riding. Transfer: 2019: Included from Spoleto train station (15 min). This is an easy 2 hour train trip from Rome.